Former software sales manager Derrick Bell took a redundancy package from his job in 2008 and set up Toby Wagons, a maker of children’s pull-along wagons. He got the idea for the business when his mother, who was looking for a wagon for an Easter egg hunt, could only find them on US websites. Bell designed his own wagons and found a manufacturer in China to make them. His initial plan was to sell them to retailers but he quickly discovered that, to make enough of a margin, he’d have to sell them himself online. So that’s what he did, setting up Tobywagons.com in 2012, and selling online for a fraction of what his mother would have had to pay. What’s your business’s elevator pitch? 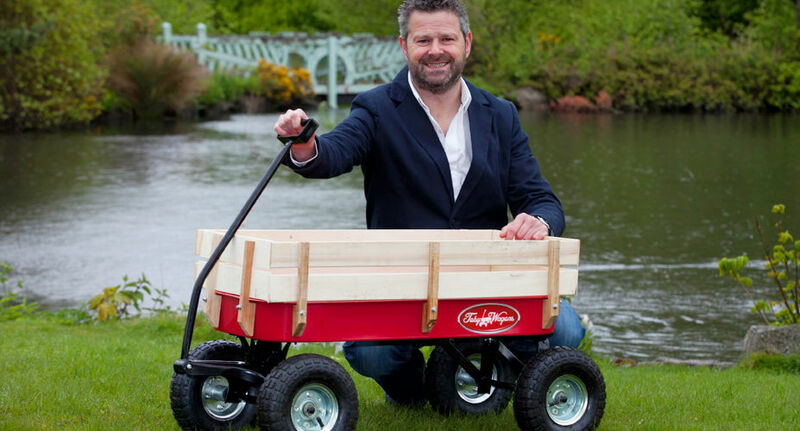 Toby Wagons was started to introduce our brand of American-style red wagon to the Irish market. In 2013 we launched in the UK. I’m now looking at bringing our cost-effective, high quality product all over Europe and into markets as far afield as Australia. Toby Wagons will be a brand that people will recognise. What do you regard as your business’s greatest achievement? Getting started with minimum funds, no real experience and no bank loan was the biggest hurdle. For the first few months it was panic stations about how I was going to pay the mortgage, but it began building momentum and now runs successfully with a lot of scope for growth. That has to be the greatest achievement considering how few businesses make it from concept to reality. In the run up to our first Christmas I was interviewed on national radio about the product, giving me great exposure with the prospect of massive sales to follow. I was over the moon because I knew the revenue from Christmas sales would give me breathing space and allow me re-invest in the business over the following few months. An hour later I got an email from China to say my order was delayed and wouldn’t arrive until January, so I effectively lost Christmas. I went from ecstasy to agony in minutes. I told a friend of mine about the delayed Christmas order wiping me out and he said, “Do you know what that’s called? Business.” His words stuck with me, and I realise that setbacks and problems will occur in business. Accept them, don’t dwell on them and keep moving forward. I’m all for taking risks. Although not a gambler in the common sense of the word, when I have an idea I tend to run with it. Some have worked and some have failed. For example, I invested in balance bikes but they haven’t done as well as I’d hoped, but that’s what keeps it exciting. Who has inspired or motivated you and why? I like Richard Branson. He has a private island, a safari park and an exciting lifestyle. Setting up a company to fund a lifestyle, rather than for the sake of business, seems like a good motivation. I’m not saying I want all his trappings but the way I view it, business success will give me the financial freedom to pursue things I want to do in life. What do you do, if anything, to switch off from the business? I figured out from the start that leaving the 9-5 rat race only to swap it for a time-consuming job working for myself, 10 hours a day, seven days a week, and for less pay, wasn’t ideal. So I don’t. I do get emails and calls in the evening, but I respond when back at work next day, albeit in my kitchen. Business is on a computer, and I can run it from anywhere. Very little. I was new to this whole industry, so had to learn along the way. Even the mistakes I made were beneficial in the end. What lessons have you learned in business that others could apply? Use the Internet to keep your costs down. I went online to learn how to build websites and do my own search engine optimisation. I also use it to outsource tasks cheaply. I got a guy through Fiverr.com to create French content for tobywagons.fr, another guy to create logos for me and another to give me 10 top tips to make my website better, all for a fiver. Finally, if there was one piece of business advice you’d like to give to another business owner, what would that be? Nothing you do is wrong as long as you learn from it. You are going to make mistakes so don’t get despondent when you do, and keep moving forward. And don’t forget to enjoy it. Most employees harbour the thought of working for themselves. You are doing it. Take the time every now and again to enjoy that fact. Take an afternoon off for a game of golf or a visit to the museum with your kids. You have to enjoy the fact that you are your own boss.